Fra Luca Bartolomeo de Pacioli (sometimes Paciolo) (c. 1445 – 1517) was an Italian mathematician and Franciscan friar, collaborator with Leonardo da Vinci, and seminal contributor to the field now known as bookkeeping and accounting. He who does nothing makes no mistakes; he who makes no mistakes learns nothing. The quest for our origin is the sweet fruit's juice which maintains satisfaction in the minds of the philosophers. Hi this has nothing to do with this page but just want to say this isn't reliable. Books should be closed each year, especially in partnership because frequent accounting makes for long friendship. The first published work describing the double entry accounting system and giving us insight into the logic behind the accounting entries is the Summa de Arithmetica, Geometria, Proportioni et Proportionalità... 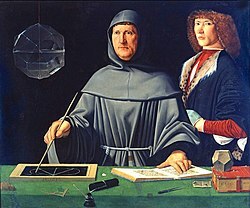 Repeatedly Pacioli stated that he described a system of bookkeeping that had been in use in Venice for more than 200 years, with the purpose of acquainting the merchants of his time with the method for keeping in good order their accounting books (chap. 1). Thus he did not mention things that were common practice a long time before 1494, as his treatise was a text for the untutored. Hence, Pacioli omitted most of the refinements common in practice of that day.